This outfitter is honest and will work for you. He offers some good elk, whitetail and mule deer and also deer/antelope combos. They hunt approximately 175,000 acres. As you can see from the pictures his mule deer and whitetails are good representative animals, with some trophy animals too. He has a number of ranches to hunt. Whitetails commonly are in the 130-155 class- good deer! His mulies are in the 155 to 175 class- also good deer! Of course he also has taken much larger deer (and smaller), but these are the common ranges size wise. His antelope are good and his elk hunting can produce some really big bulls. Normally you can expect to see at least two dozen bucks in the course of your hunt, and you can see nearly that many sometimes in a single day! So you need to look hard at this operation if you want a nice deer or if you want a good elk with bow! Success on deer and antelope borders on 90 to 100% with rifle, less with bow of course. He hunts both Montana and North Dakota. He has been in business for over 20 years hunting mule deer, whitetail deer, elk, antelope, turkey, upland birds, varmints, black bear and mountain lion. We have worked with him for about 10 years. He has hunts for the rifleman, muzzleloader and archery enthusiast. His hunts are located in Eastern Montana and western North Dakota; and on private property in Montana and North Dakota as well as the Lewis and Clark National Forest in central Montana. The hunting camps vary from wall tents, to camper trailers, to cabins to his home base lodge in some of the best-known deer country in Montana, the Powder River Breaks, the Milk River, and the Yellowstone River drainages. Mule Deer hunts take place on very large private ranches. The terrain varies from dry, rolling grasslands up to rough canyons with cuts and pockets of brush and trees. There are also open fields of grain and meadows of hay that lead up to patchy and heavy pine and cedar trees providing cover for the deer during hot fall afternoons. On this hunt, you will often see 20 to 50 deer daily. Success rate is over 95% with the outside spread on the antlers between 20-28 inches with 20-25 being about average. Here is a western big game hunt that everyone must do at least once. The early October weather offers lots of fun and action at an affordable price. The country they hunt in Eastern Montana produces some of the largest horned antelope in the state. The average is just over 13 inches and bucks 15 and even over 16 inches have been taken every year. 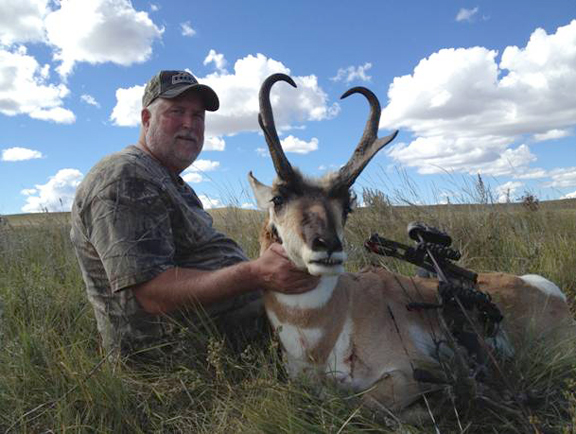 You will often see 50 to 100 antelope daily and success rate runs 97%-100% on these hunts. This is a great first time hunt with lots of action and high success for both deer and antelope. WE would expect you to take both species barring terrible weather or poor shooting. By combining the two together you get a very affordable hunt. This is your opportunity to take two North American big game animals in one trip. Their success rate runs 95-100% on deer between 18 to 24 inches and on antelope 12 to 14 inches. 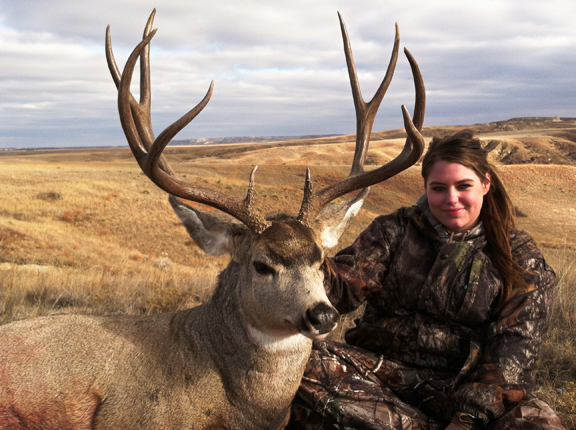 Their Whitetail deer hunts take place on some of Eastern Montana’s finest whitetail country. The land is characterized by river bottoms with large hay and grain fields leading up to dry, rough, rolling grasslands with broken patches of trees and brush spread throughout the hills. They hunt a variety of different rivers, including the Yellowstone River, Milk River, Tongue River, Powder River, Missouri River, Little Missouri River and Musselshell River. The best time to hunt big bucks is during the November rut. They typically use binoculars to locate your buck and then stalk to within range or else jump the deer from a bedded area. Success is high for bucks with 16-22 inch outside spreads, scoring 125-155 B&C. And you normally see a lot – a lot- of deer! In addition to the REGULAR antelope, mule deer and whitetail hunts they also offer a very limited number of TROPHY EXCLUSIVE HUNTS. These hunts take place on ranches that allow no other hunting and are managed for BIG deer only. Whitetails will be in the 140″-165″ class and mule deer in the 150″-185″ class. They tightly limit the number of hunters. Each ranch offers something different, get in contact with us for availability and rates. Very limited numbers of clients on these ranches, so do not hesitate to book early, they will go quickly. This is an excellent bow hunt offering both archery mule deer, as well as archery whitetails. With the help of pre-season scouting and some of the best deer country in Eastern Montana, they pattern deer to and from their bedding and feeding areas. They then set up ground pits, tree stands, ground blinds, decoys and even they will do stalking to get you within range. You may see three or more mature mulie or whitetail bucks traveling in bachelor groups during bow season. The whitetail hunts are conducted along the river bottoms that have nearby agriculture. 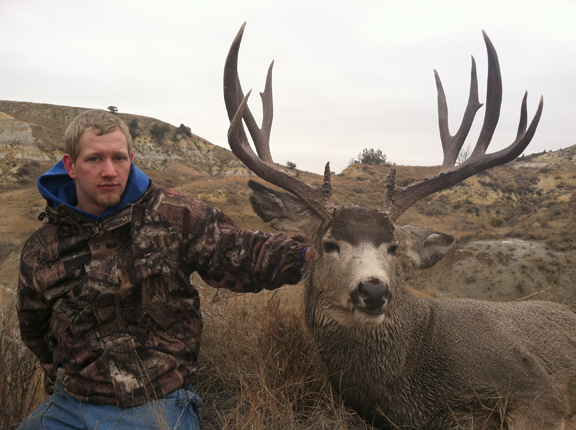 The mule deer hunts are done in the hills, badlands and canyons doing spot and stalk hunting. 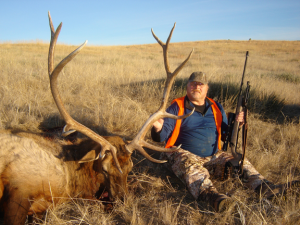 Elk hunts take place on the Lewis and Clark National Forest Lands as well as some bordering private ranches. The terrain varies from rolling hills, grasslands, creek bottoms to heavy timbered mountains with semi-open parks. Hunting is done with the aid of 4×4 trucks, four-wheelers and hiking. Archery elk season is in September in heavy timber, in good populations of elk when bugling during the Sept. rut. The outfitter uses stands along agricultural fields and trails the bulls are using during the rut with good opportunities. Rifle elk season is the last week of October and all of November. Bulls range from 5×5, to 6x6s in the 260-350 class. He hunts along the famed Powder River and Little Missouri Rivers, the Milk River and others, which is all classic mulie and whitetail country. His elk hunting ranch (free ranging of course) is in Central Montana and features a number of bulls in the 280-400 class! Chuck Adams likes this area a whole bunch! The ranch is strictly Archery ONLY! Another nice plus is that you can add on an antelope. He has some excellent turkey hunting for Merriam’s and some good prairie dog hunting if you tag out early. And he has just added a superb archery hunt for w/tails and mulies in North Dakota. A draw deer license for 2011 is currently $542; elk is $812; combo deer and elk is $912; and you can optionally add $20 for a preference point if you don’t draw. 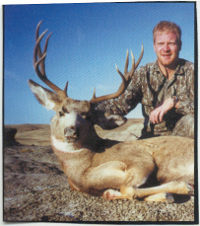 Basic Hunts – Target 4×4 and larger 22-29 inch deer scoring 140”-160”. Hunt ranches with 10,0000 combined acres. Total of 20-25 hunters per year. TROPHY Hunts – Target 4×4 and larger 24-30 inch deer scoring 160”-180”. Hunt ranches with 25,000 combined acres. Total of 5-6 hunters per year. EXCLUSIVE Hunts – Target 4×4 and larger 26-32 inch deer scoring 170”-200”. Hunt 50,000 acre ranch. Total 2-3 hunters per year.